This vendor will dispense letter fruits that are delicious and healthy. 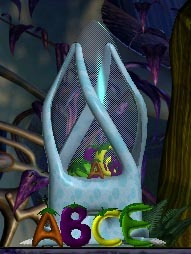 Clicking on each of the four different fruits produces a creature voice sound. Each ABC fruit has one of three additional effects; any creature who eats one may receive a small (10%) dose of Antihistamine, Vitamin C or Vitamin E.
Created by AquaShee, the ABC vendor was originally hosted at Albian Oceans, but is now available from Creatures Caves. This page was last modified on 11 April 2015, at 19:00.